With water hazards on half of its holes, the course has six signature holes and presents many more memorable tests and risk-and-reward dilemmas. 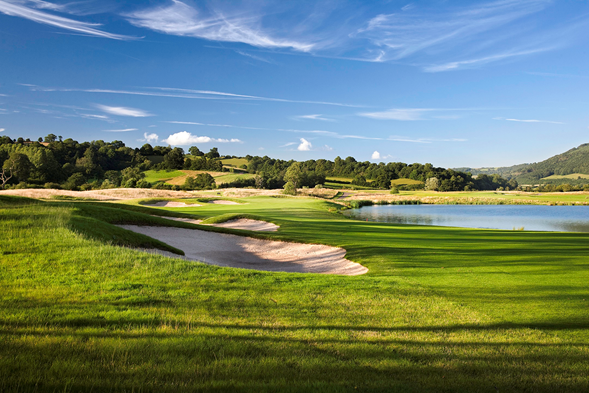 One of the features of the spectacular new course is its variety with many of the earlier holes having a links-like feel with long rough and greenside swales, before the middle section reveals the full extent of the lake-lined challenge. 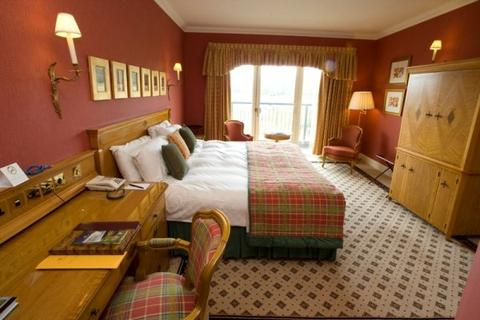 Each of our rooms and suites reflect Celtic Manor’s style of distinctive design and traditional luxury. 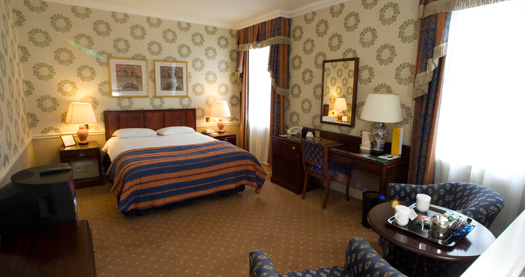 Our superior rooms offer a queen size double bed and spacious marble en-suite with bath and separate shower. Choose from double or twin beds and the option of a balcony. For those seeking a little more space, deluxe rooms offer enormous king size beds for those who love to lounge and have the added option of a spacious balcony. Our Resort King with Sofa Bed can accommodate two adults and one child, whilst our Resort Superior Family features two queen size double beds and can accommodate two adults and two children plus a cot, with the optional benefit of a balcony. The exceptionally spacious Resort Grand Deluxe Family rooms cater for the larger family, with two king size beds, a double sofa bed, and yet more space for an extra child’s bed if required. Please note there is a £5 supplement charge for breakfast for all children over three years of age. All hotel bedrooms feature complimentary Wi-Fi, perfect when the kids want to chill out and play games or keep in touch with friends. Each of our Deluxe Suites are individually decorated to the highest standard and feature a master bedroom with large double bed, a separate lounge and dining area, marble bathroom, iPod docking station, Nespresso coffee machine and flatscreen televisions in the sitting room and bedroom. The two Presidential Suites are perfect for those seeking the ultimate in luxury with large terraces, a spacious sitting room and a private dining area for up to 10 guests, as well as a master bedroom with marble bathroom, oversized bath and double shower with steam facility, a guest bedroom with bathroom, a small kitchen area and a guest cloakroom. History, charm and bags of character, this beautiful 19th century country house has it all. Think sweeping down the grand wooden staircase, collapsing onto a romantic four-poster bed, taking Sunday afternoon tea in Hedleys dining room, or drinks before dinner in the grand Manor Lounge. 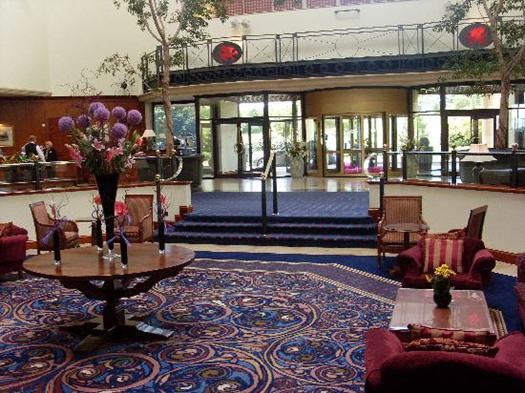 The Manor House hotel offers historic country house charm, with all the luxurious facilities of a world-class resort. Our recently refurbished Manor House accommodation has been given a modern, stylish new look with beautiful bedrooms and luxurious bathrooms. Newly refurbished featuring chic and stylish décor, queen-size bed and luxurious en-suite with bath and shower. Newly refurbished, offering the same stylish décor and features as the Manor Double but with two single beds. Newly refurbished and offering extra space for families, this spacious stylish room with king-size bed and luxurious en-suite has an adjoining lounge area with space for two extra beds, comfortably accommodating two adults and two children plus a cot. Situated within the original 19th century Manor House itself, these atmospheric rooms are rich in character and historic period features, complemented by traditional country house décor. Offering the same features as the Manor Period Double but with a larger king-size bed. These rooms boast a queen-size wooden four-poster bed. Each one echoes the romantic charm of The Manor House with traditional décor and are ideal rooms to celebrate a special night away. All the historic character of our other Manor Period rooms but with two queen-size beds, accommodating two adults and up to two children plus a cot. Please note breakfast will be served in The Olive Tree Tues-Fri.
Nestled in the peaceful tranquility of the beautiful Usk Valley with breathtaking views over The Twenty Ten golf course, experience all the luxuries and service of a world-class five star resort combined with the exclusivity and privacy of your very own home-from-home. Chill out in the Kooky Kestrel, pamper and luxuriate in the Plucky Pheasant, or live it up in the Swanky Swallow lodge. All come made for sharing with four fabulous en-suite bedrooms, and a decadent outdoor hot tub with views to die for. The sensational open plan space at the heart of each lodge was just made for entertaining, relaxing and dining together, while a cosy chill out room is the perfect place for me time, us time or family play time. The maximum occupancy for each lodge is 8 people (excludes babies under 2 years sleeping in cots). 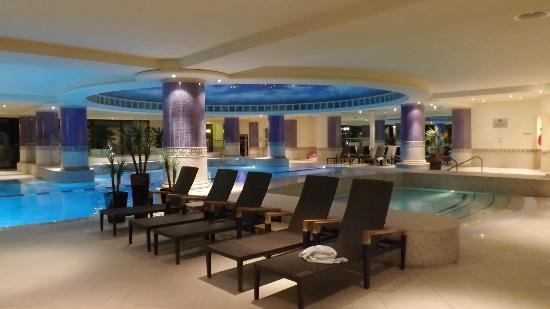 Escape to the tranquil haven of The Forum Spa and feel your stresses ease away as you relax and unwind in a world of sheer luxury and indulgence. Voted Readers' Choice Best UK Hotel Spa and Best for Golf & Spa UK in the 2014 Spa Traveller Awards, The Forum Spa immediately envelopes you in a sanctuary of serenity and tranquility. Whether your focus is on facial, body or sensory indulgence, we will take you on a journey through your senses of well-being, offering you the finest spa treatments and the most contemporary therapies available. Many are universal to both men and women. The 16 beautifully appointed treatment rooms are designed to welcome and relax our guests. With soft ambient lighting, aromatic scents and luxurious electronic therapy couches, they ensure total privacy so that you can feel rejuvenated, restored, and relieved of all stress. 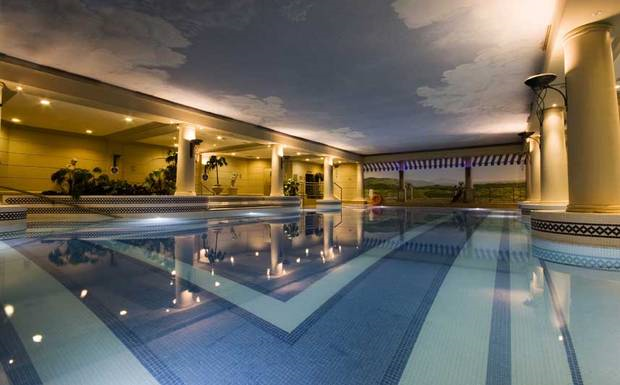 Set in the luxurious surroundings of the Celtic Manor Golf Club, just a stone’s throw from the Resort Hotel, the Ocius Treatment Rooms are designed for people looking for a short escape from the pressures of everyday life. The name Ocius comes from the Latin word for “quick” and perfectly sums up the express treatments offered at the treatment rooms. Here you can enjoy a range of express beauty and wellbeing treatments including results-driven facials and massages, together with our most popular signature treatments. The Grill with its far reaching views over the Severn Estuary is a great place to eat, drink and relax during your time at Ocius. Our 3 AA Rosette flagship fine dining venue is something truly special, offering an exciting culinary experience that’s sure to impress. Sharing an exquisite meal and fine wine is one of life’s greatest pleasures, and the effortless elegance and sensational cuisine of this award-winning restaurant will ensure you enjoy a dining experience to remember. This is truly a food lover’s heaven, set in the most luxurious of surroundings. Chef Tim McDougall’s intricate menu reflects seasonality with a strong emphasis on the use of locally sourced ingredients, producing fresh, intense and punchy flavours. An atmospheric private lounge with its own bar and comfortable sofas, provides the perfect place to meet up and relax before lunch or dinner, and in the evenings, enjoy a pre-dinner drink or cocktail while canapés are served. This charming hideaway in the historic surroundings of the original 19th century Manor House, echoes the simple, relaxed style of an authentic French bistro. With a fabulous menu of satisfying, hearty dishes that change with the seasons and define regional, homely French cuisine, the cooking is a rustic country style. 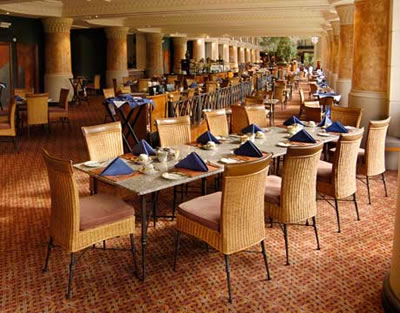 Renowned for its informal style and friendly service, Le Patio is perfect for family dining. The intimate, candlelit atmosphere also makes it an ideal setting for a romantic meal for two. And in the summertime, guests can enjoy alfresco dining, at their request, on the very patio from which the restaurant takes its name. Laid-back dining, honest and simple no-nonsense food. From breakfast through to dinner, The Grill’s tempting menu of wholesome ingredients mixes distinctive flavours and textures that just work together, offering a mouthwatering mix of comforting favourites including succulent steaks, pasta, fresh fish, salads and burgers. This warm and welcoming clubhouse restaurant boasts great food anytime of the day, with cosy fires and spectacular views overlooking the Roman Road golf course. And don’t worry about getting there, we’ll happily provide complimentary shuttles for hotel guests to and from the clubhouse. You might also like to know that The Olive Tree has its own cocktail bar, a great place to meet for pre-dinner drinks or indeed any other time of the day. This luxuriously relaxed restaurant makes a striking statement with its soaring cedar wood beams which lend the restaurant both its name and its unique atmosphere. Set within the prestigious Twenty Ten Clubhouse, diners will enjoy the stunning views over The Twenty Ten course and beautiful Usk Valley. 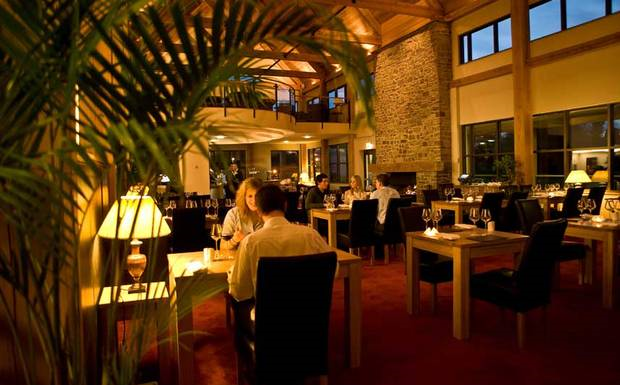 The cuisine here is simple and elegant, from locally reared beef to fresh fish and seafood, Rafters’ talented chefs use many local ingredients to create succulent steak and grills. And don’t worry about getting there, we’ll happily provide complimentary shuttles for hotel guests to and from The Twenty Ten Clubhouse. This light and airy café overlooking the Forum pool offers soup, sandwiches and jacket potatoes for those in search of a healthy snack, and a tempting selection of coffee and cakes for those who aren't. With its comfortable sofas, conservatory and inviting sun terrace overlooking the Rooftop Garden, Merlins is a fantastic bar at the heart of the Resort. Merlins is a great place to meet friends and enjoy morning coffee, an afternoon snack or evening drinks in glorious surroundings. 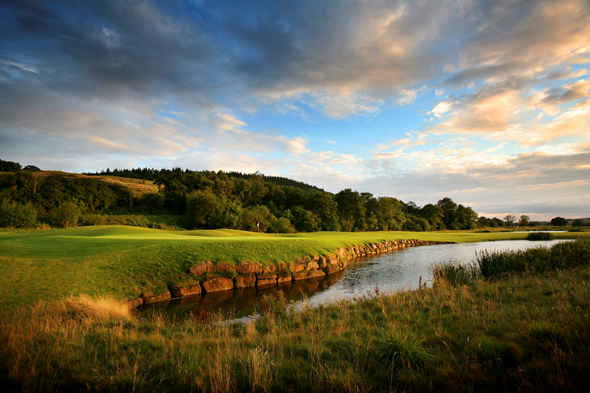 As venue for the 2010 Ryder Cup and home of The Celtic Manor Wales Open, a leading European Tour event, The Celtic Manor Resort offers some of the finest golf courses and facilities in the UK. 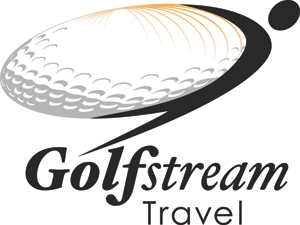 These include the Robert Trent Jones Snr designed Roman Road course, The Montgomerie, designed by Ryder Cup legend and next European Team Captain, Colin Montgomerie and The Twenty Ten, which is the first course in history specifically designed to host The Ryder Cup. There is also a world-class golf academy featuring a floodlit two tier driving range, short game area, golf shop and teaching bays. The courses are served by two luxurious golf clubhouses - The Twenty Ten Clubhouse and The Lodge, which is one of Europe's largest clubhouses. 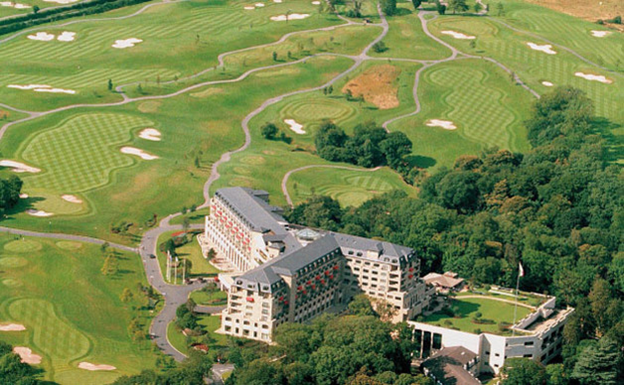 As well as the golfing facilities Celtic Manor boasts two hotels - a five star Resort Hotel and a 19th century Manor House. Other facilities include five restaurants, two health spas, a creche, family games room, tennis courts, clay pigeon shooting, mountain biking and walking trails. 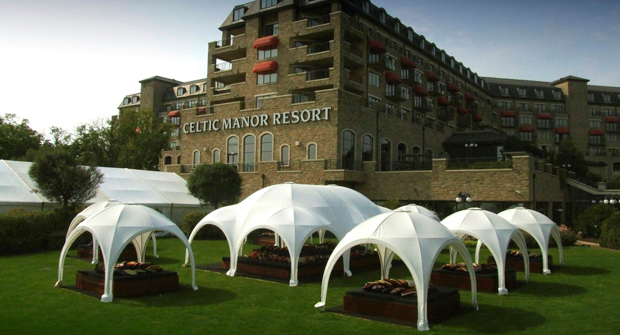 Celtic Manor is also a major venue for conferences and events and has been voted three times the 'UK's Top Conference Hotel' by readers of the leading trade magazine, Conference & Incentive Travel.